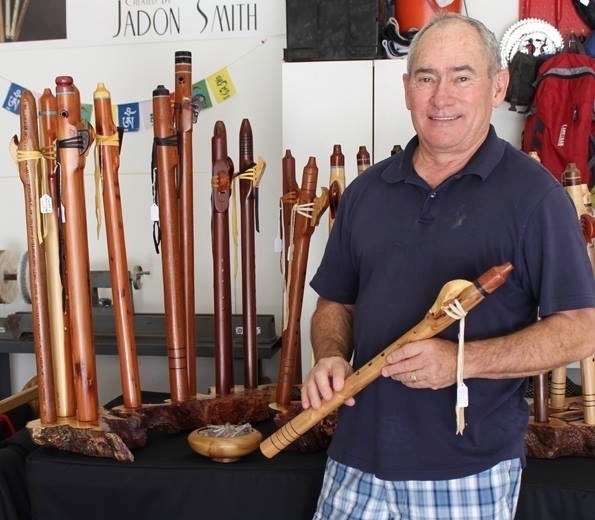 I am proud to announce a collaboration with international recording artist, Bernard "Wolfsheart" Weilguni, to create a signature Native American Flute. This flute, is designed to capture the essence of the Wolfsheart experience. The flute is tuned to a Mid F Minor key, representing the heart chakra, and features wolf fetish. The body of the flute is made of Paduk, symbolizing the heart. Each is capped with an exotic wood mouthpiece, ringed in turquoise and has the four directional holes. All carry the signature of Wolfsheart. These flutes are available through the Nipomo Flute website or on Etsy.com/nipomoflutes. A Native American Misic Award winner, Bernard Wolfsheart Weilguni performs internationally with the band, Big City Indians. His numerous videos are available via youtube, with CD's available on Etsy. Copyright ©2019 Nipomo Flutes. All Rights Reserved.